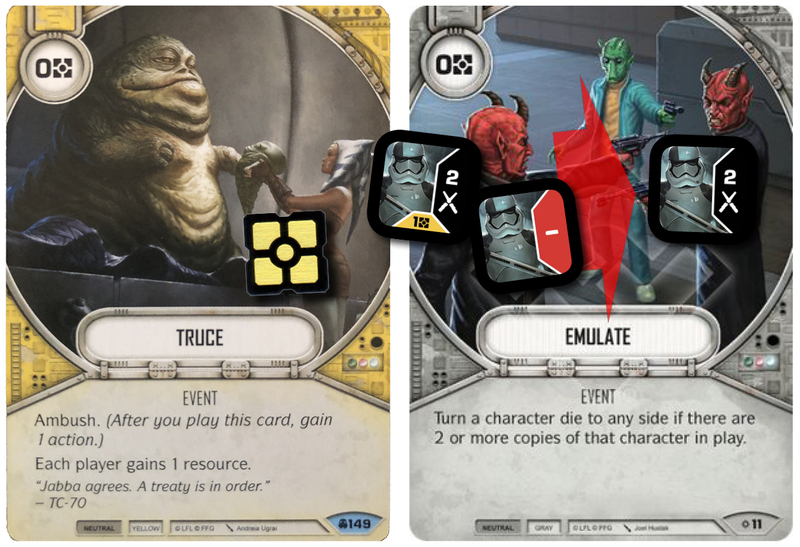 A couple of months ago Winton McKay aka Hessian Sack published an eYoda/Hera/L3-37 Deck Analysis on our website, and while that deck is dead and gone with rotation, we couldn't resist the temptation to have him back on with his new take on one of our favourite decks: eAphra/Executioners! The deck was originally piloted by none other than Luke Magnuson at US Nationals 2018 and looked really strong during the Way of the Force Meta. Is there a way for the deck to force itself back into the meta after rotation and the arrival of Convergence? Btw. 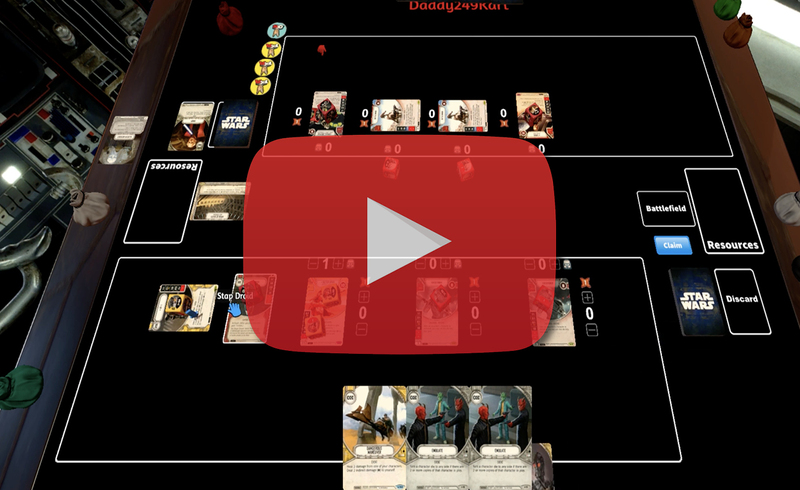 I've heard that Winton McKay played the Aphra/Executioners deck a whole lot already! Check out the original analysis of Luke Magnuson's eAphra/Executioners. I’d like to quickly touch upon the general strategy you have to understand to play this deck and how you should be thinking about damage and health. When you sit down across the table facing off against any deck, one of the first things you should do is evaluate the total health. For example, Aphra/General Grievous3/Battle Droid/Battle Droid has a staggering total of 31 health. This is a pretty important part of piloting an Indirect-focused deck well. Then take a look at each of the characters and choose which one to target first. The largest deciding factor is the Executioner ability. Most of my opponents tend to forget about it and put the Indirect damage dealt on their low-health characters, which are generally the least useful, in an attempt to protect their high-health characters. I want a fast kill so I can get some mileage out of the Executioner ability. In the example above, you should target a Battle Droid because they have the lowest health. (Hopefully) gaining another roll-out and more damage to get the next character near-death. I'm certain that the Convergence meta will see plenty of Big/Little teams. 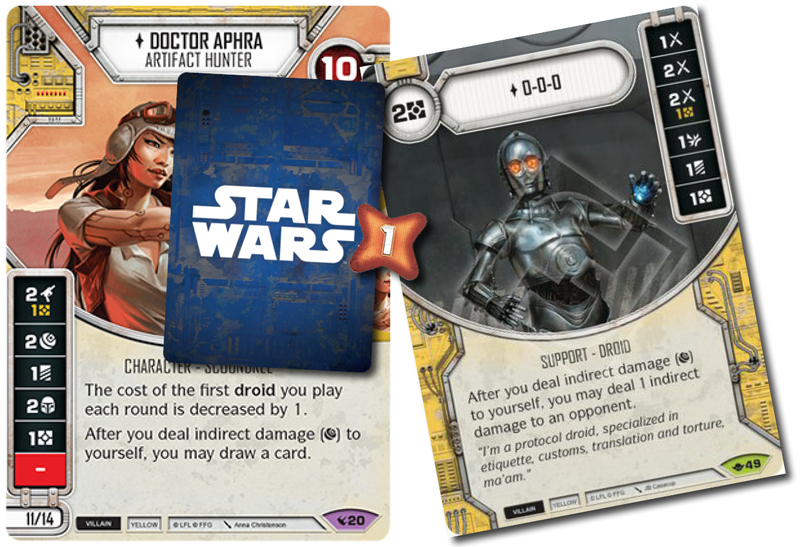 The problem with Indirect damage into Big/Little character teams is that they can pile the damage onto the “little” while the “big” pounds you with large portions of Direct damage threatening to take out Aphra early. 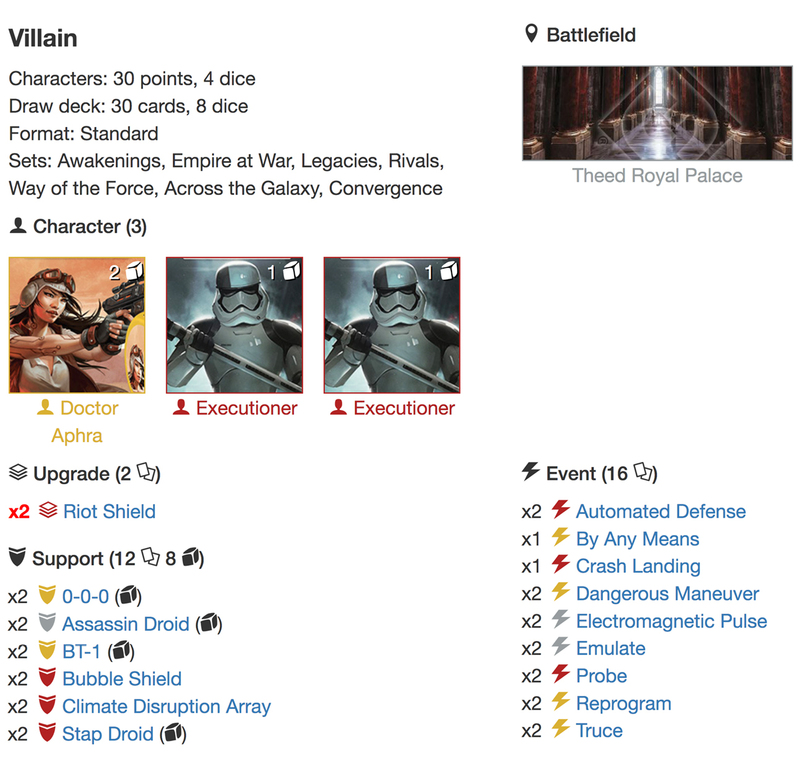 This makes most Indirect-dealing decks much less viable, but it plays straight into the game plan of Aphra/Executioners. This deck thrives against three-wide (they include low health characters to trigger that Executioner ability), while it does just as well against Big/Little decks which often include an even lower health character. The possible match-ups are one of the main reason why I expect this deck to do well in the Convergence meta. The biggest weakness of this deck is pay-sides. It always has been, and always will be. The easiest way to lose a game with this deck is by getting overconfident, playing all your cards, and then relying on rolling resources to pay for your dice. The number of resource sides included in the deck is quite low, your characters and 0-0-0 each have a ⅙ chance of hitting a Resource side. Nothing feels worse than getting that extra roll out to hit damage you can’t pay for. The most skill-intensive part of playing this deck is resource management, by a long stretch. There are some cards included like Reprogram, Emulate and Truce that can lighten the load of the pay sides. If you want to become better at managing your resources with any deck, I’d recommend getting some games in with this. The other weakness is losing your Executioners quickly. They’re one of the major damage sources, and once they go down, you’re in trouble. 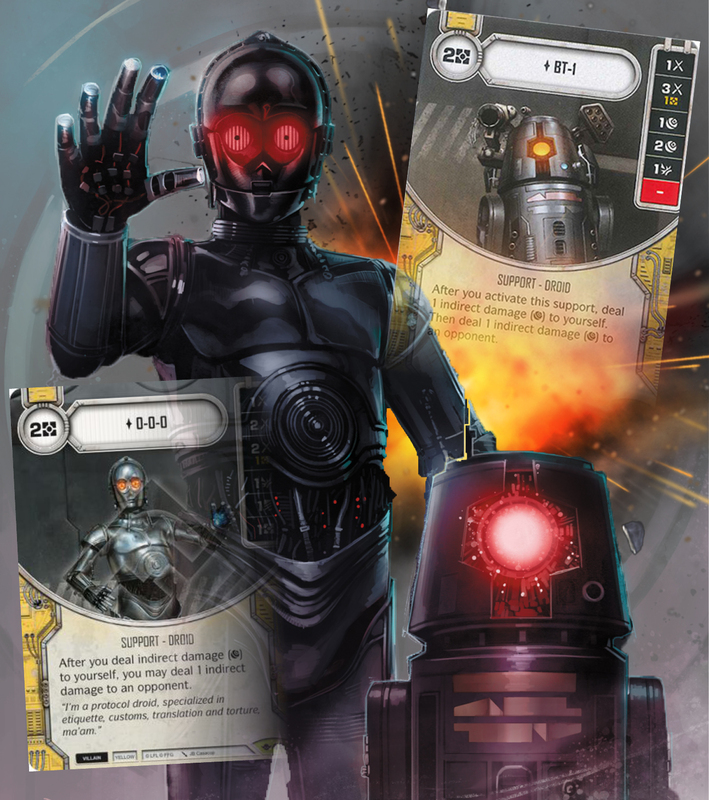 Play your murder droids, 0-0-0 and BT-1, roll damage, and be very careful to time your kills. If it’s the end of the round and you can get that important kill that will let you roll out those Executioners, save it. Unless you miraculously have both money and cards, don’t do it yet, you want those kills early or mid-round. Always make sure you’ll get maximum value out of that ability. As I mentioned earlier, you should make sure you go for the fastest kill (i.e. against Vader3/Greedo you should go for the quick kill on Greedo). I’ve been asked why I include this over Tech Team or Logistics. The main argument here is that giving my opponent a resource is normally a bad idea. I picked Truce because of the Ambush keyword that makes it so versatile. Tech Team will save me more money over the course of the game, but it’s restricted to supports and costs a resource to play which I often can’t spare in the early game. One of the main reasons for including Truce is so I can resolve those pay-sides quickly and before they’re mitigated. If I need 2 resources, then I can play Truce, then use the Ambush to resolve a resource or Theed Power Action to the same effect as Logistics. I consider this an auto-include. With a deck so susceptible to bad rolls, a bit more consistency can’t hurt, and Emulate is a very strong way to add it. 0-cost, with a requirement that is normally pretty easy to meet. 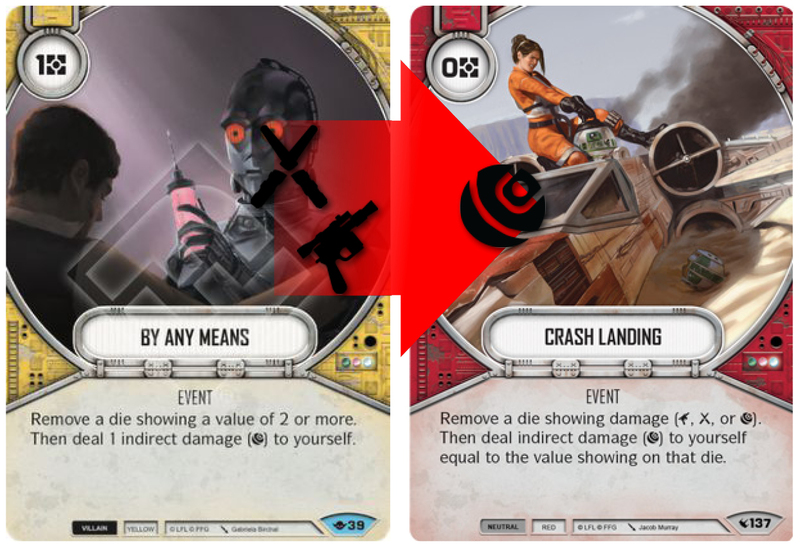 I’m not sold on this card, it’s included for Shadow Caster, Aphra, and Padme matches but in almost every other match it feels useless. This one is on the bubble. Some people might play two copies of both these cards, but I don’t think you need both as 2-ofs. I’m not sure which is better, so I have one copy of each. I have two copies of this in my version because I feel it’s so good once you have 0-0-0 down. One copy could be replaced with an Ark Angel, which adds a lot of speed to your rounds. I didn’t include the Hailfire Droid Tank because I never really managed to play it. The 4 Resource cost is just too prohibitive (even with Aphra's discount). I eventually replaced it with the Assassin Droid. The Assassin Droid’s damage on activation can make for explosive turns where you activate, kill a character with the ping, and roll out the Executioners. This one seems really good. Attaching it to one of the Executioners gives it an effective 11 health. You obviously don’t use it to block your own Indirect damage except in quite extraordinary situations. 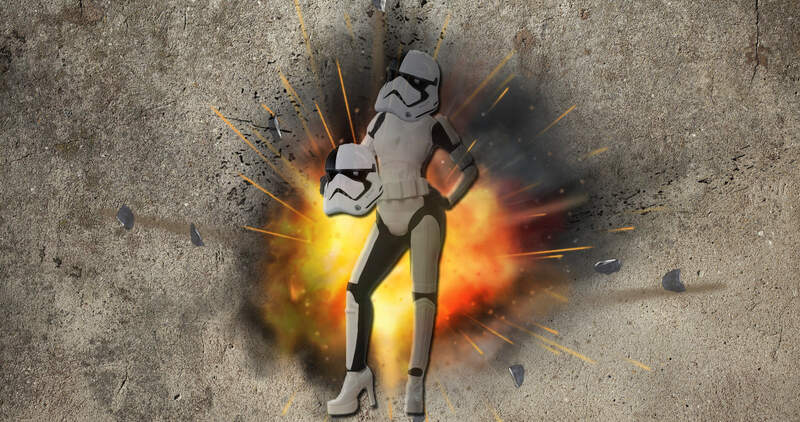 I've found it to be a huge help against Palpatine3 with his monstrous abilities and Phasma3 with her overwhelming First Order Storm Trooper dice. It’s a delicious combination of Force Illusion and Armor Plating. The roll-off for the Battlefield currently feels like one of the most important parts of the game. And your choice of Battlefield is an important part of your deck building process. 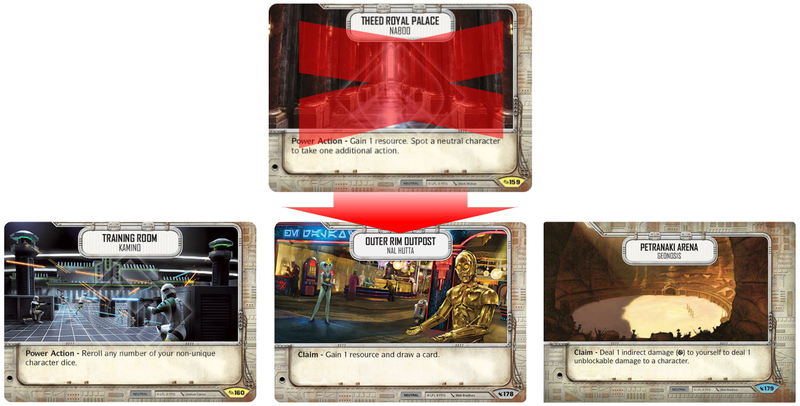 At the moment Theed Royal Palace is OBVIOUSLY the best choice for many decks, including this one. When Theed is almost inevitably nerfed, we'll need to look into alternative choices. I'll briefly discuss my preferred alternatives here. This is my least favourite of the three. The Power Action has some potential, but most of the time I’ll be rerolling one die and hoping for some damage. Aphra’s draw ability gives us plenty of rerolls anyway. There are some people who think this is the best option, but I quite plainly think they’re wrong. Outer Rim Ooutpost seems to be a good replacement. Theed has already shown us how powerful another resource is, and this is just a powered-down Theed. The draw a card is nice, but keep in mind the number of cards you’re drawing, and how easy it is to be milled. That seems pretty good, eh? The biggest issue with this is still dealing yourself that one Indirect damage, but in the end, you can always claim the battlefield without using the claim ability. If you win the roll off and have 0-0-0 in your starting hand, then it’s pretty safe to pick this one. If you don’t have 0-0-0, or your opponent’s battlefield is going to further your own game plan then I'd probably just take the Shields. The mulligan is pretty simple with this deck. You’re not normally looking for removal round one, as there aren’t many mitigation cards in the deck, and you want to save them for later in the game when your opponent has already built their board state. There’s no point removing two damage early in the game when you could be removing four in subsequent rounds. If you don’t pull 0-0-0 in your starting hand, keep one droid, maybe a Reprogram along with it, and pitch the rest looking for 0-0-0. If you don’t get him in your starting hand, chances are you’ll draw him with Aphra’s draw ability. 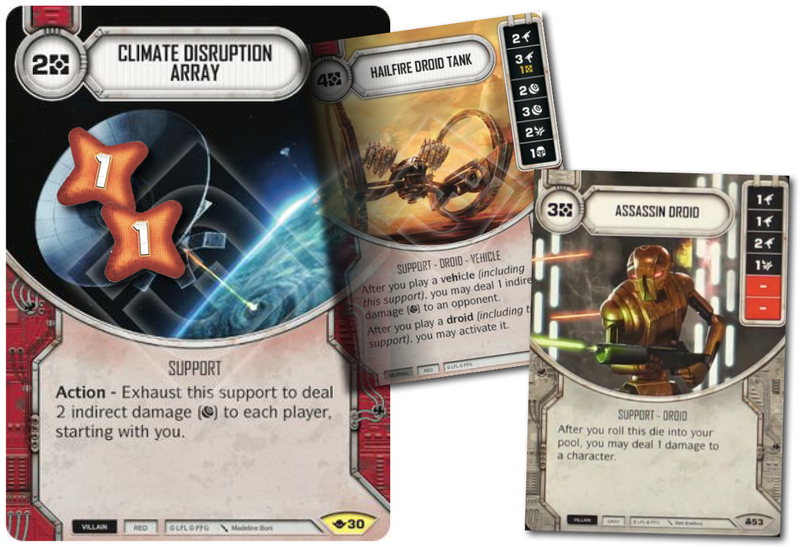 STAP Droids are also fine to have round one, but Climate Disruption Array and Assassin Droids are too expensive early on and should be pitched. I’ve said big things about this deck with no real proof that any of it is true. I’ve posted five TTS Gameplay videos to my YouTube Channel. I hope you enjoy them! Other than that, you’ll just have to trust me!